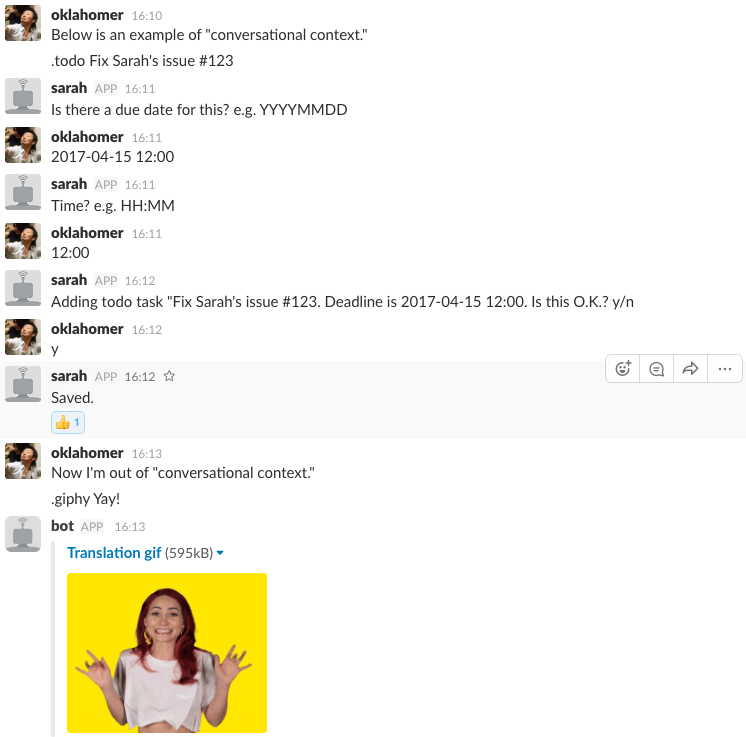 As mentioned in the latest blog post, I created a new bot framework: go-sarah. This article introduces its notable features and overall architecture along with some sample codes. Upcoming articles should focus on details about each specific aspect. In this project, user's conversational context is referred to as "user context," which stores previous user states and defines what function should be executed on following input. While typical bot implementation is somewhat "stateless" and hence user-and-bot interaction does not consider previous state, Sarah natively supports the idea of this conversational context. Its aim is to let user provide information as they send messages, and finally build up complex arguments to be passed. When configuration file for a command is updated, Sarah automatically detects the event and re-builds the command or scheduled task in thread-safe manner so the next execution of that command/task appropriately reflects the new configuration values. See the usage of CommandPropsBuilder and ScheduledTaskPropsBuilder for detail. Developers may implement their own bot by a) implementing sarah.Bot interface or b) implementing sarah.Adapter and pass it to sarah.NewBot() to get instance of default Bot implementation. Either way, a component called sarah.Runner takes care of Commmand execution against given user input. 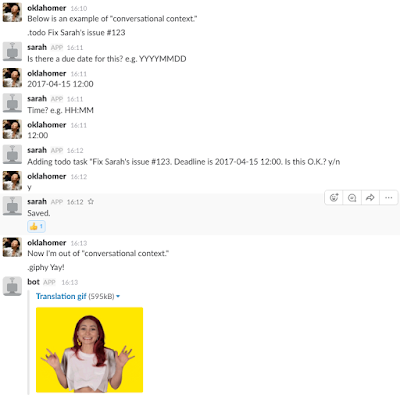 This sarah.Runner dispatches tasks to its internal workers, which means developers do not have to make extra effort to handle flooding incoming messages. When a bot confronts critical situation and can not continue its operation or recover, Sarah's alerting mechanism sends alert to administrator. Zero or more sarah.Alerter implementations can be registered to send alert to desired destinations. To have higher customizability, Sarah is composed of fine grained components that each has one domain to serve; sarah.Alerter is responsible for sending bot's critical state to administrator, workers.Worker is responsible for executing given job in a panic-proof manner, etc... Each component comes with an interface and default implementation, so developers may change Sarah's behavior by implementing corresponding component's interface and replacing default implementation. Below illustrates some major components. 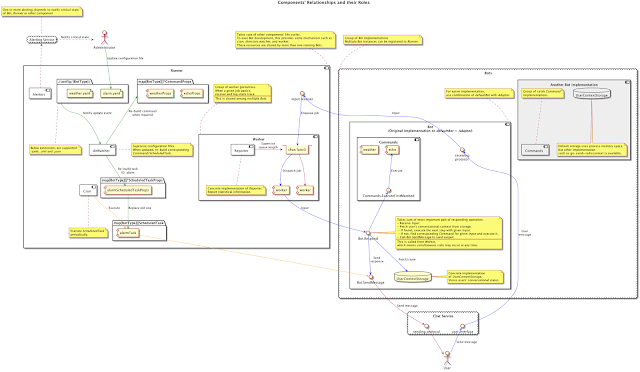 Runner is the core of Sarah; It manages other components' lifecycles, handles concurrent job execution with internal workers, watches configuration file changes, re-configures commands/tasks on file changes, executes scheduled tasks, and most importantly makes Sarah comes alive. Runner may take multiple Bot implementations to run multiple Bots in single process, so resources such as workers and memory space can be shared. Bot receives messages from chat services, sees if the sending user is in the middle of user context, searches for corresponding Command, executes Command, and sends response back to chat service. Important thing to be aware of is that, once Bot receives message from chat service, it sends the input to Runner via a designated channel. Runner then dispatches a job to internal worker, which calls Bot.Respond and sends response via Bot.SendMessage. In other words, after sending input via the channel, things are done in concurrent manner without any additional work. Change worker configuration to throttle the number of concurrent execution -- this may also impact the number of concurrent HTTP requests against chat service provider. Technically Bot is just an interface. So, if desired, developers can create their own Bot implementations to interact with preferred chat services. However most Bots have similar functionalities, and it is truly cumbersome to implement one for every chat service of choice. Therefore defaultBot is already predefined. This can be initialized via sarah.NewBot. sarah.NewBot takes multiple arguments: Adapter implementation and arbitrary number ofsarah.DefaultBotOptions as functional options. This Adapter thing becomes a bridge between defaultBot and chat service. DefaultBot takes care of finding corresponding Command against given input, handling stored user context, and other miscellaneous tasks; Adapter takes care of connecting/requesting to and messaging with chat service. // Any Bot implementation can be fed to Runner.RegisterBot(), but for convenience slack and gitter adapters are predefined. // sarah.NewBot takes adapter and returns defaultBot instance, which satisfies Bot interface. slackConfig := slack.NewConfig() // config struct is returned with default settings. Command interface represents a plugin that receives user input and return response. Command.Match is called against user input in Bot.Respond. If it returns true, then the command is considered "corresponds to user input," and hence its Execute method is called. Define a struct that implements Command interface. Pass its instance to Bot.ApendCommand. Use CommandPropsBuilder to construct a non-contradicting set of arguments, and pass this to Runner.Runner internally builds a command, and re-built it when configuration struct is present and corresponding configuration file is updated. Below are several ways to setup CommandProps with CommandPropsBuilder for different customization. // CommandProps is a set of configuration options that can be and should be treated as one in logical perspective. // This can be fed to Runner to build Command on the fly. // CommandProps is re-used when command is re-built due to configuration file update. // ".echo foo" to "foo"
// To have complex checking logic, MatchFunc can be used instead of MatchPattern. // Call some other setter methods to do the rest. // Configurable is a helper function that returns CommandProps built with given CommandConfig. // CommandConfig can be first configured manually or from YAML/JSON file, and then fed to this function. // Runner detects the change and re-build the Command with updated configuration struct. With CommandPropsBuilder.ConfigurableFunc, a desired configuration struct may be added. This configuration struct is passed on command execution as 3rd argument. Runner is watching the changes on configuration files' directory and if configuration file is updated, then the corresponding command is built, again. To let Runner supervise file change event, set sarah.Config.PluginConfigRoot. Internal directory watcher supervises sarah.Config.PluginConfigRoot + "/" + BotType + "/" as Bot's configuration directory. When any file under that directory is updated, Runner searches for corresponding CommandProps based on the assumption that the file name is equivalent to CommandProps.identifier + ".(yaml|yml|json)". If a corresponding CommandProps exists, Runner rebuild Command with latest configuration values and replaces with the old one. ScheduledTask implementation can be fed to Runner.RegisterScheduledTask. When Runner.Run is called, clock starts to tick and scheduled task becomes active; Tasks will be executed as scheduled, and results are sent to chat service via Bot.SendMessage. Technically any struct that satisfies ScheduledTask interface can be treated as scheduled task, but a builder is provided to construct a ScheduledTask on the fly. // TaskProps is a set of configuration options that can be and should be treated as one in logical perspective. // This can be fed to Runner to build ScheduledTask on the fly. // ScheduledTaskProps is re-used when command is re-built due to configuration file update. With ScheduledTaskPropsBuilder.ConfigurableFunc, a desired configuration struct may be added. This configuration struct is passed on task execution as 2nd argument. Runner is watching the changes on configuration files' directory and if configuration file is updated, then the corresponding task is built/scheduled, again. To let Runner supervise file change event, set sarah.Config.PluginConfigRoot. Internal directory watcher supervises sarah.Config.PluginConfigRoot + "/" + BotType + "/" as Bot's configuration directory. When any file under that directory is updated, Runner searches for corresponding ScheduledTaskProps based on the assumption that the file name is equivalent to ScheduledTaskProps.identifier + ".(yaml|yml|json)". If a corresponding ScheduledTaskProps exists, Runner rebuild ScheduledTask with latest configuration values and replaces with the old one. defaultUserContextStorage is a UserContextStorage implementation that stores ContextualFunc, a function to be executed on next user input, in the exact same memory space that process is currently running. Under the hood this storage is simply a map where key is user identifier and value is ContextualFunc. This ContextFunc can be any function including instance method and anonymous function that satisfies ContextFunc type. However it is recommended to use anonymous function since some variable declared on last method call can be casually referenced in this scope. go-sarah-rediscontext stores combination of function identifier and serializable arguments in Redis. This is extremely effective when multiple Bot processes run and user context must be shared among them. e.g. Chat platform such as LINE sends HTTP requests to Bot on every user input, where Bot may consist of multiple servers/processes to balance those requests. When registered Bot encounters critical situation and requires administrator's direct attention, Runner sends alert message as configured with Alerter. LINE alerter is provided by default, but anything that satisfies Alerter interface can be registered as Alerter. Developer may add multiple Alerter implementations via Runner.RegisterAlerter so it is recommended to register multiple Alerters to avoid Alerting channel's malfunction and make sure administrator notices critical state. Bot/Adapter may send BotNonContinurableError via error channel to notify critical state to Runner. e.g. Adapter can not connect to chat service provider after reasonable number of retrials. That is pretty much everything developers should know before getting started. To see working example code, visit https://github.com/oklahomer/go-sarah/tree/master/examples. Fore more details, make sure to follow upcoming blog posts.